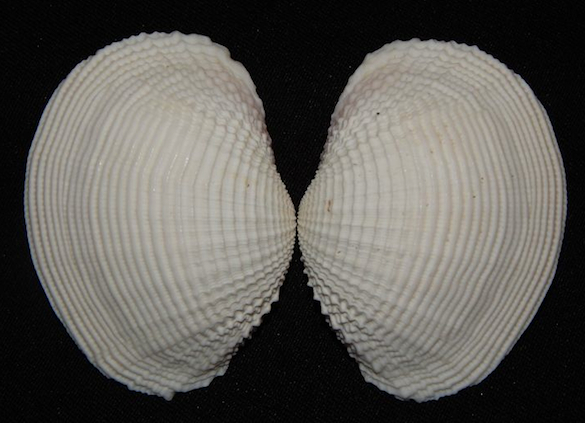 Above is a specimen of the lucinid bivalve Fimbria sp. 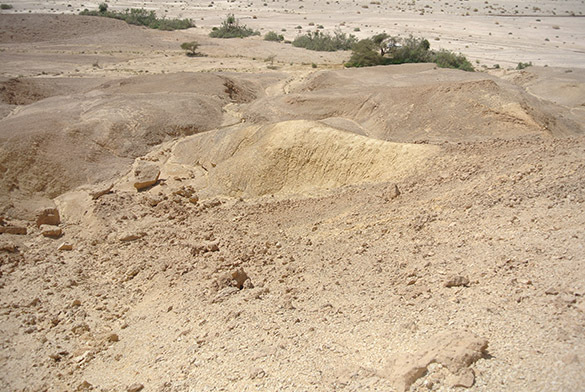 from the Matmor Formation (Middle Jurassic) of Makhtesh Gadol in southern Israel. I collected it in 2007 while working with Meredith Sharpe (Wooster ’08) as she pursued the fieldwork for her Independent Study project. It is a nice specimen in part because of its preservation. A closer look (below) shows very fine detail of the shell exterior. The shell is no longer present, though. It was originally composed of the mineral aragonite, which was dissolved away, leaving an external mold that later filled in with very fine crystals of calcite. The sculpture of the shell is exquisitely reproduced; in some places even so well as to show growth lines. Many aragonitic bivalves and gastropods are preserved this way near the top of the Matmor Formation. Lucinid bivalves are still common today in the sea. The shell shown above is a modern Fimbria fimbriata from the Solomon Islands. They are infaunal, meaning they live burrowed in the sediment. Since they were not genetically endowed with long siphons, they use the foot to create mucus-lined tubes to the surface for access to seawater. Lucinids have an endosymbiotic relationship with sulfide-oxidizing bacteria in their gill tissues. They have a hemoglobin type that transports hydrogen sulfide to autotrophic bacteria, which in turn provide the bivalves with nutrition and enable them to survive in a variety of environments, from near deep-sea hydrothermal vents to shallow seagrass meadows. Johann Karl Megerle von Mühlfeld (1765-1842) named Fimbria in 1811. I very much wish I had a portrait to go with that magnificent name. Megerle von Mühlfeld worked at the Naturhistorisches Museum in Vienna through the eventful Napoleonic years. He is best known for his pioneering work with insects, but he also curated the mollusk collections, which led to his description of the new Fimbria. Anderson, L.C. 2014. Relationships of internal shell features to chemosymbiosis, life position, and geometric constraints within the Lucinidae (Bivalvia), p. 49-72. In: Experimental Approaches to Understanding Fossil Organisms. Springer Netherlands. Megerle von Mühlfeld, J.K. 1811. Entwurf eines neuen System’s der Schalthiergehäuse. Gesellschaft Naturforschender Freunde zu Berlin, Magazin 5: 38-72. Monari, S. 2003. A new genus and species of fimbriid bivalve from the Kimmeridgian of the western Pontides, Turkey, and the phylogeny of the Jurassic Fimbriidae. Palaeontology 46: 857-884. Morton, B. 1979. The biology and functional morphology of the coral-sand bivalve Fimbria fimbriata (Linnaeus, 1758). Records of the Australian Museum 32: 389-420. Taylor, J.D. and Glover, E.A. 2006. Lucinidae (Bivalvia)–the most diverse group of chemosymbiotic molluscs. Zoological Journal of the Linnean Society 148: 421-438. 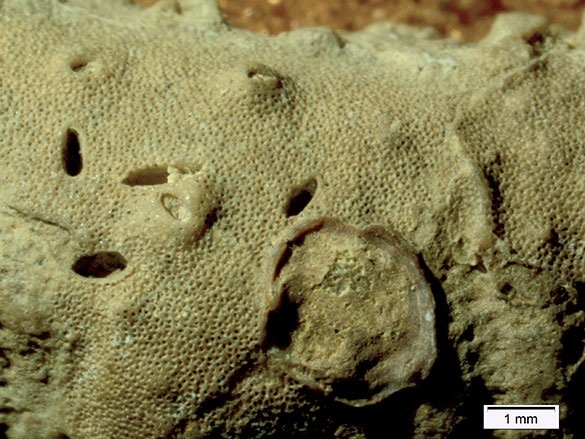 We are pleased to introduce to the world four new species of Jurassic cyclostome bryozoans. 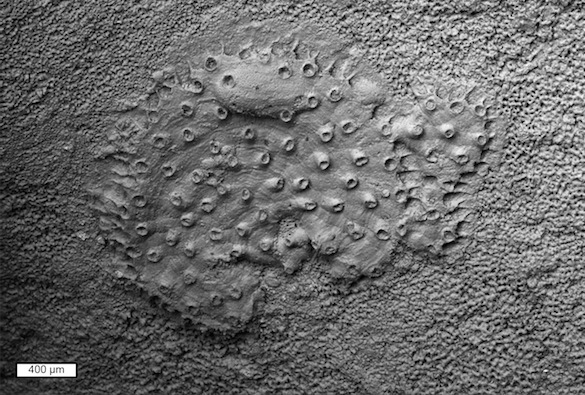 In a paper that has just appeared in the Bulletin of Geosciences, Steph Bosch (’14), Paul Taylor and I describe the first tropical Jurassic bryozoan fauna (see Wilson et al., 2015, below; it is open access and a free download). This work was the basis of Steph’s excellent Senior Independent Study thesis, and it could not have been done without Paul’s bryozoan mastery and his scanning electron microscopy skills. 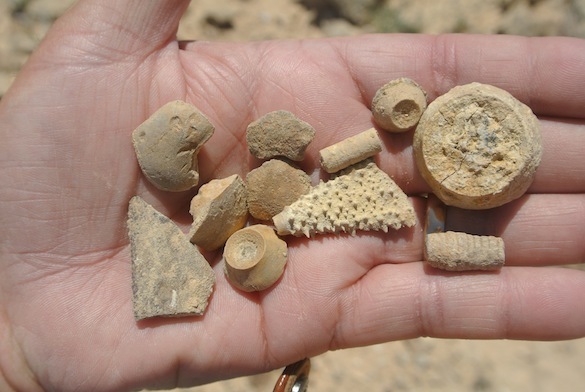 We found six bryozoan species in the Matmor Formation (Middle Jurassic, Callovian) exposed in Hamakhtesh Hagadol, southern Israel, four of which are new to science and shown in this post. The image above is a colony of Hyporosopora nana n. sp. attached to a crinoid ossicle. Identifying and classifying Jurassic cyclostome bryozoans almost always involves finding the specialized reproductive gonozooids. Here we see a close-up of the gonozooid on H. nana. The ooeciopore (an opening for communication with the water outside) is at the distal end on the right. The species name “nana” means “small” in Latin and refers to the small size of the autozooids (feeding zooids). This is Hyporosopora negevensis n. sp., named after its type location in the Negev. On the right side of the colony you can see its characteristic boomerang-shaped gonozooid. Idmonea snehi n. sp. is named after my good friend and superb geologist Amihai Sneh of the Geological Survey of Israel. Amihai has now “retired” officially after a distinguished career, but continues to work. 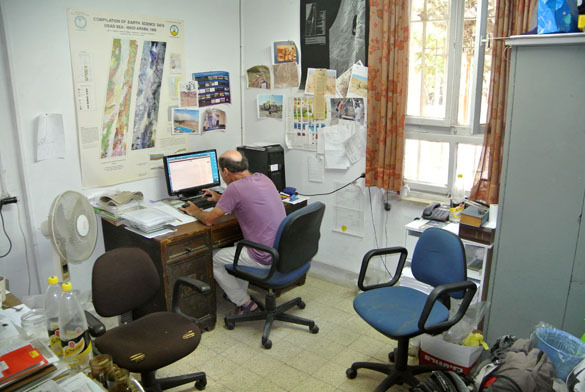 He is the lead author of the new Geological Map of Israel. Turns out I have no images of him with his face to the camera. This is a color optical image of I. snehi to show what these fossils look like outside the SEM. The wiggly lines you see in the background are where the host crinoid columnals articulate in the stem. (The crinoid is Apiocrinites negevensis.) 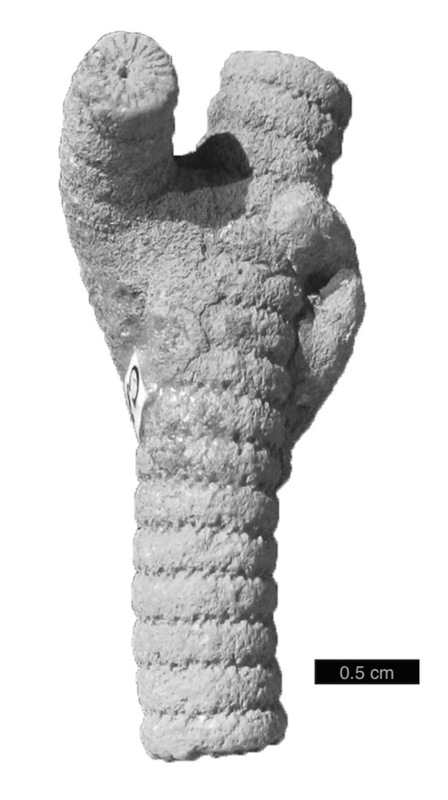 I. snehi has the earliest example of lateral branching in a post-Paleozoic cyclostome, and is now the only published example of lateral branching in any Jurassic bryozoan. Microeciella yoavi n. sp. (above) has a gonozooid with a spherical brood chamber, visible near the center of the image. It is named after another good friend and colleague, Yoav Avni of the Geological Survey of Israel. Yoav has been my field companion for over a decade now and is most responsible for the logistical and scientific success of our expeditions into the Negev. Yoav even accompanied the Wooster Geologists on our last departmental field trip to the Mojave Desert. Team Israel 2013 worked hard to find the bulk of the bryozoans used in this study. They are shown above at one of our most productive sites in Hamakhtesh Hagadol. We took a group photo in Jerusalem in July 2013. 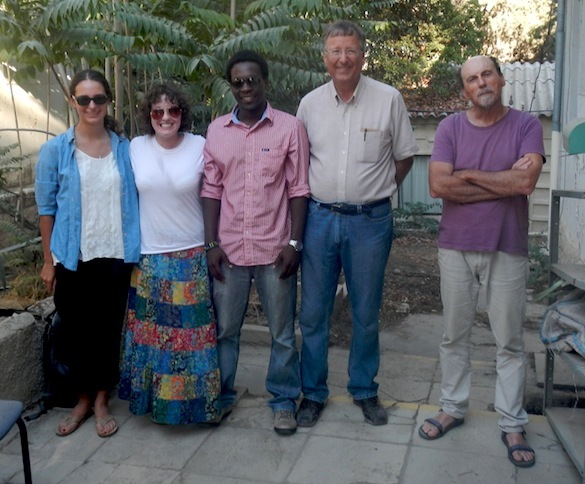 On the left is Steph Bosch (’14; bryozoan expert); next to her is Lizzie Reinthal (’14; crinoid specialist); then Oscar Mmari (’14; he worked on Cretaceous phosphates but also valiantly collected Jurassic bryozoans); then me; and on the far right Yoav Avni. Please download and read the paper for more information and context on this study. 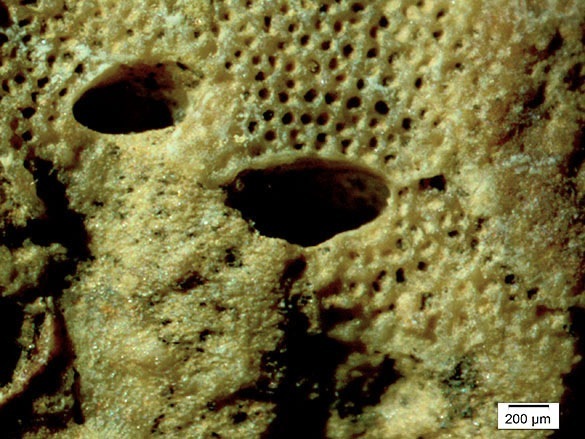 The Matmor bryozoans are most similar to their counterparts in the Callovian of Poland. The low diversity of the Matmor bryozoan fauna is not unusual for the Jurassic, but they are less abundant than contemporaneous bryozoan faunas from higher paleolatitudes in Europe and North America. 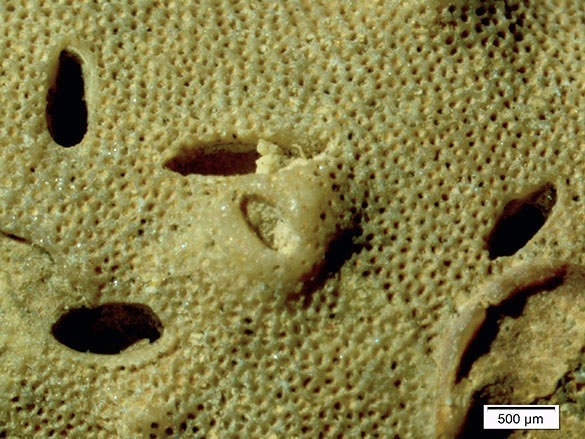 The unusually small zooids of the Matmor bryozoans may be a function of the “temperature-size rule” because this fauna developed in shallow, warm, tropical waters. Ausich, W.I. and Wilson, M.A. 2012. 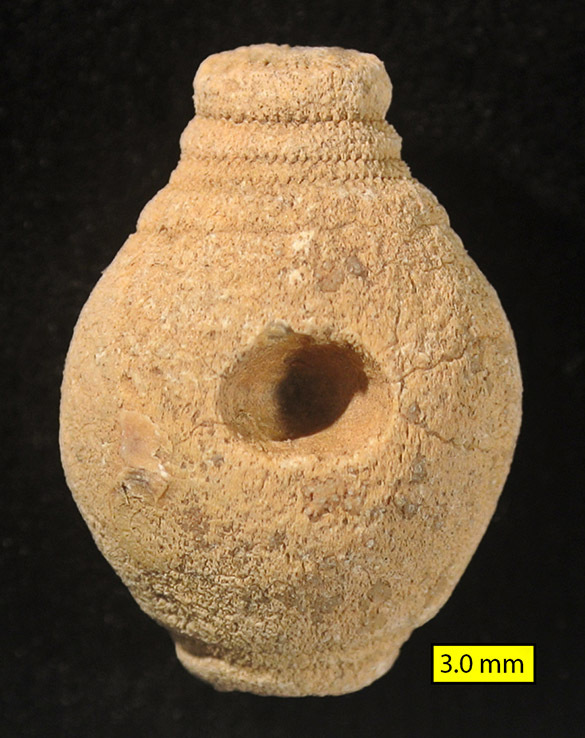 New Tethyan Apiocrinitidae (Crinoidea, Articulata) from the Jurassic of Israel. Journal of Paleontology 86: 1051–1055. Feldman, H.R. and Brett, C.E. 1998. Epi- and endobiontic organisms on Late Jurassic crinoid columns from the Negev Desert, Israel: Implications for co-evolution. Lethaia 31: 57–71. Wilson, M.A., Bosch, S. and Taylor, P.D. 2015. 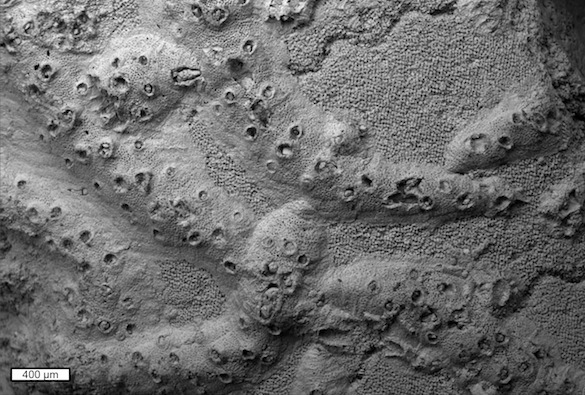 Middle Jurassic (Callovian) cyclostome bryozoans from the Tethyan tropics (Matmor Formation, southern Israel). Bulletin of Geosciences 90: 51–63. Wilson, M.A., Reinthal, E.A. and Ausich, W.I. 2014. Parasitism of a new apiocrinitid crinoid species from the Middle Jurassic (Callovian) of southern Israel. Journal of Paleontology 88: 1212-1221. Zatoń, M. and Taylor, P.D. 2009. 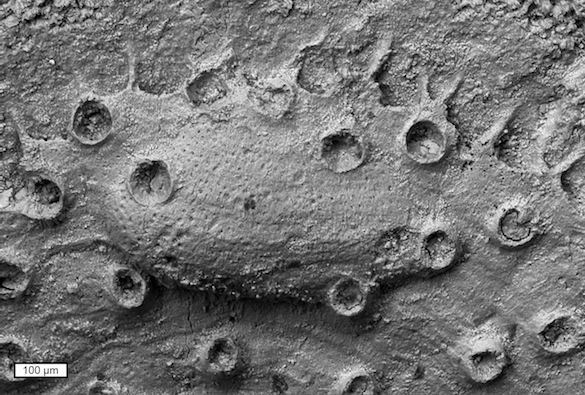 Middle Jurassic cyclostome bryozoans from the Polish Jura. Acta Palaeontologica Polonica 54: 267–288. This week we revisit a group of fossils covered in an earlier blog post. It is now the subject of a paper that has just appeared in the journal Lethaia entitled, “Bitten spines reveal unique evidence for fish predation on Middle Jurassic echinoids“. My co-authors are my good Polish colleagues Tomasz Borszcz and Michał Zatoń. 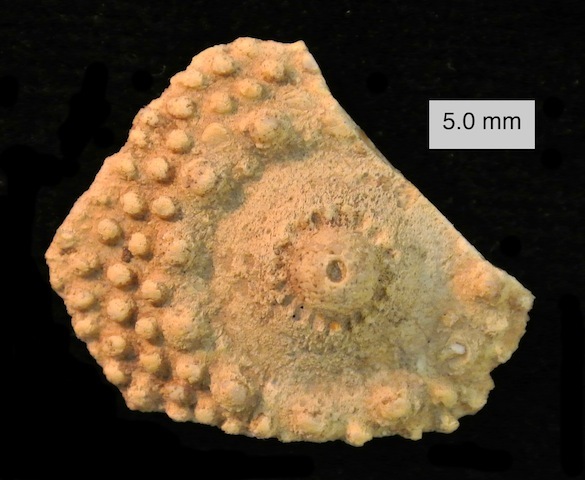 Above is one of these bitten echinoid spines from the Matmor Formation (Callovian) of Hamakhtesh Hagadol, the Negev, southern Israel. Many Independent Study students who worked in Israel over the past several years helped me collect hundreds like it. Now we have at last sorted through them systematically, collected the data, and published our analysis as a Lethaia Focus paper. 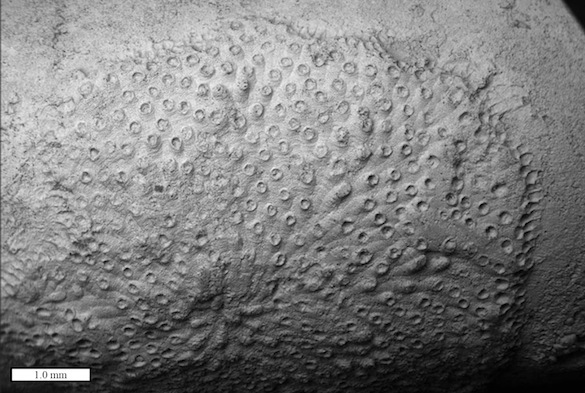 We have here the earliest direct evidence of fish predation on echinoids (“sea urchins” in this case) through these numerous bite marks. The echinoid was a species of Rhabdocidaris, which was very spiny. As you can see in the above image, the spines are diverse in shape and size. 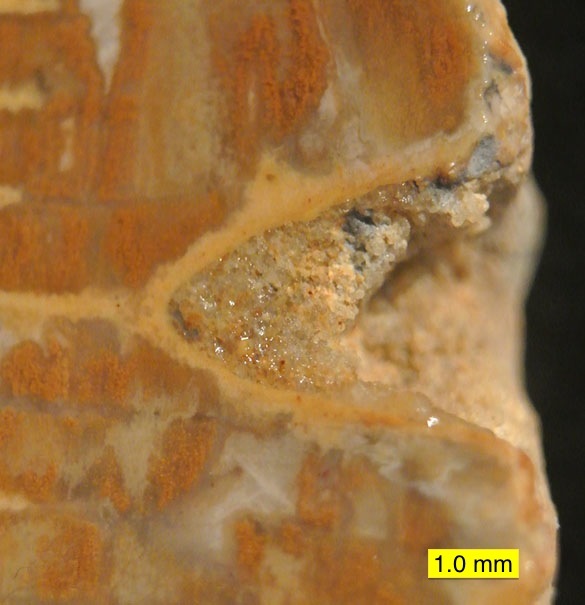 The large, flat ones easily preserve encrusters and bite marks. We collected and assessed 1266 spines; 57 of them (4.5%) are bitten. 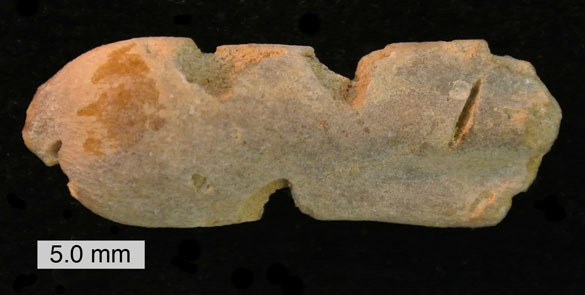 A test fragment from Rhabdocidaris found with the spines. Bits of the test (the main skeleton surrounding the body) are not nearly as common as the spines. The central elevation (the boss) is where a single spine was attached. Here is a collection of fossil echinoderm fragments from this site. Most are from crinoids, but I’m sure you’ve noted the two echinoid spines there. The variability of bite marks on the spines suggests that the predator manipulated the echinoids for some period, as shown by the sheephead fish (Semicossyphus pulcher) that feeds on sea urchins today. This YouTube video (expertly filmed by Joseph See and used with permission) shows a sheephead biting and tossing about an echinoid before forcing it open. Imagine what the spines would look like that are scattered about on the seafloor. This is the scenario we imagine for our Jurassic echinoids. Predation is an important selective force in the evolution of communities, so this first evidence of direct predation on echinoids is an important data point in the explanation of how Mesozoic invertebrate marine communities changed in structure and composition after the Permian mass extinctions. Geerat Vermeij began the modern discussion of predation’s role in evolution with his 1977 paper on the Mesozoic Marine Revolution. We’re proud to have our work in this tradition. If you want a pdf of our new Lethaia paper, please contact me. 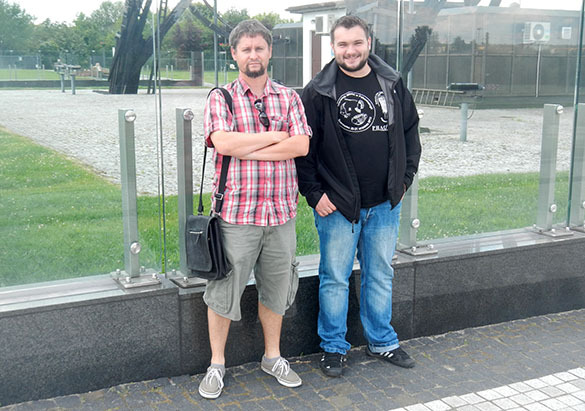 Borszcz, T. and Zatoń, M. 2013. The oldest record of predation on echinoids: evidence from the Middle Jurassic of Poland. Lethaia 46, 141–145. Vermeij, G.J. 1977. The Mesozoic marine revolution; evidence from snails, predators and grazers. Paleobiology 3, 245–258. Wilson, M.A., Borszcz, T. and Zatoń, M. 2014. Bitten spines reveal unique evidence for fish predation on Middle Jurassic echinoids. Lethaia (DOI: 10.1111/let.12110). Wilson, M.A., Feldman, H.R., Bowen, J.C. and Avni, Y. 2008. A new equatorial, very shallow marine sclerozoan fauna from the Middle Jurassic (late Callovian) of southern Israel. Palaeogeography, Palaeoclimatology, Palaeoecology 263, 24–29. Wilson, M.A., Feldman, H.R. and Krivicich, E.B. 2010. Bioerosion in an equatorial Middle Jurassic coral-sponge reef community (Callovian, Matmor Formation, southern Israel). Palaeogeography, Palaeoclimatology, Palaeoecology 289, 93–101. Zatoń, M., Villier, L. and Salamon, M.A. 2007. Signs of predation in the Middle Jurassic of south-central Poland: evidence from echinoderm taphonomy. Lethaia 40, 139–151. These fossils are a joy to present this week. Lizzie Reinthal (’14), Bill Ausich (Ohio State University) and I have a new paper out in the latest issue of the Journal of Paleontology. It is titled: “Parasitism of a new apiocrinitid crinoid species from the Middle Jurassic (Callovian) of southern Israel”. Allow me to introduce Apiocrinites feldmani, a new articulate crinoid species. In the image above we have fused columnals (the “buttons” that make up a crinoid stem) upwards through two radial plates (from the calyx) with two pits and associated swollen columnals (due to a nasty little parasite; see below). A gnarly beast it is, and that’s what makes this creature interesting. I posted another even more twisted specimen earlier. This new species is named after my friend Howard Feldman of Touro College and the American Museum of Natural History in New York. 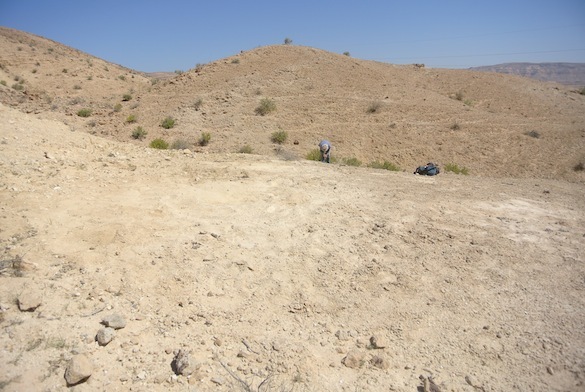 He was a pathfinder with the Matmor Formation and its fossils in Hamakhtesh Hagadol, Negev, southern Israel. This pluricolumnal shows how bad the parasitic infection could get for many A. feldmani specimens. These gall-like growths are responses to some soft-bodied parasite that became embedded within the crinoid skeleton. The crinoid stems were deformed and likely lost considerable flexibility because of these parasites. This is a cross-section through one of the pits in an A. feldmani stem. Note that the narrow end of the pit begins at the articulation between two columnals. The parasite apparently wedged into that space, forcing the crinoid to grow around it as it grew itself. The result was a conical pit with swollen columnals surrounding it. Here we’re looking straight into one of the conical pits with a magnificent swelling around it. You can barely make out the articulation lines of the swollen columnals. Sometimes these cone-shaped pits were closed off by crinoid skeletal growth, presumably because the parasite inside died or otherwise left the premises. We don’t know the identity of this parasite, but we can surmise that it was a soft-bodied filter-feeder that probably gained an advantage from living high above the seafloor on these crinoid stems. Oddly, the larger A. negevensis crinoids in the same community did not have these parasites. Living crinoids are afflicted by a variety of parasites. There are none today that have this sort of effect on the stems, but there are reports of fossil crinoids with similar pathologies all the way back to the Silurian (Brett, 1978). Even after death these Jurassic crinoid stems provided homes for other organisms. Above is another cross-section through a stem of A. feldmani. “A” is one of the columnals, “B” is a section through an articulated bivalve filled with a relatively coarse sediment, and “C” is a fine sediment that filled in around the bivalve. The bivalve bored into the crinoid stem after death to make a crypt from which it could conduct its filter-feeding with some safety and seclusion. 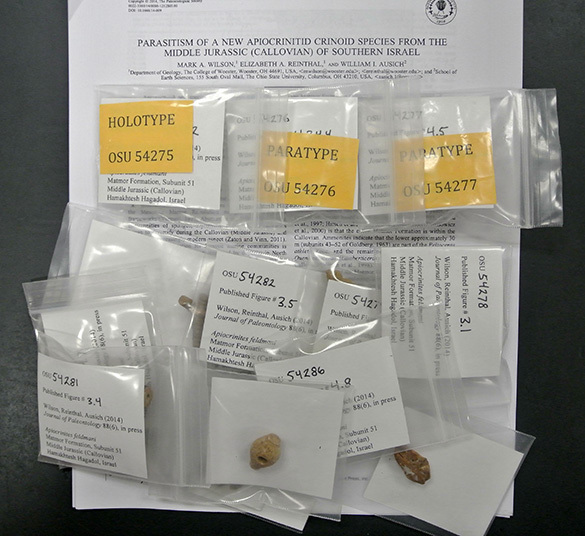 Finally, here are the type specimens of Apiocrinites feldmani all packed up to be delivered to the Orton Geological Museum at Ohio State University. This museum has a large collection of echinoderms from around the world and so is an appropriate place for our treasures to reside awaiting further study. This was a fun study that was part of Lizzie Reinthal’s 2013-2014 Independent Study project at Wooster. She concentrated on the taphonomy and sclerobiont successions as we both worked up the parasite and systematic story with our echinoderm expert friend Bill Ausich. There aren’t that many accounts of parasite-host relationships in the fossil record, so we’re proud to add one. So many beautiful fossils in the Jurassic of southern Israel. More papers to come! Brett, C.E. 1978. Host-specific pit-forming epizoans on Silurian crinoids. Lethaia 11: 217–232. Wilson, M.A., Feldman, H.R. and Krivicich, E.B. 2010. Bioerosion in an equatorial Middle Jurassic coral-sponge reef community (Callovian, Matmor Formation, southern Israel). Palaeogeography, Palaeoclimatology, Palaeoecology 289: 93–101. The stark black-and-white of these images are a clue that the fossil this week has been described in a paper. 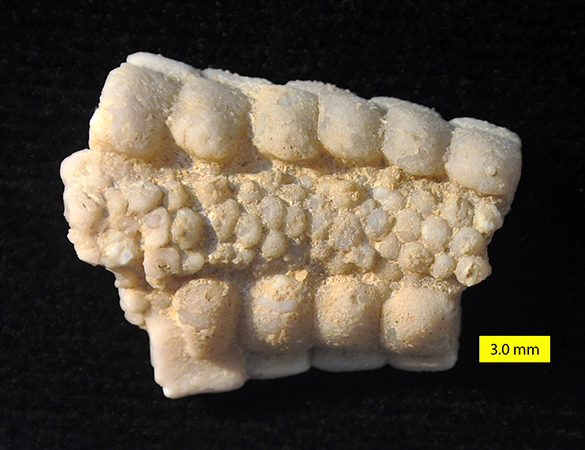 Above is the scleractinian coral Aspidiscus cristatus (Lamarck, 1801) from the En Yorqe’am Formation (Cenomanian, Upper Cretaceous) of southern Israel. 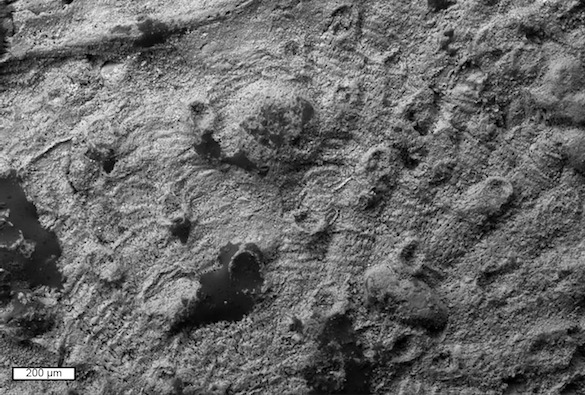 The holes are developed by and around tiny bivalves and given the trace fossil name Gastrochaenolites ampullatus Kelly and Bromley, 1984. 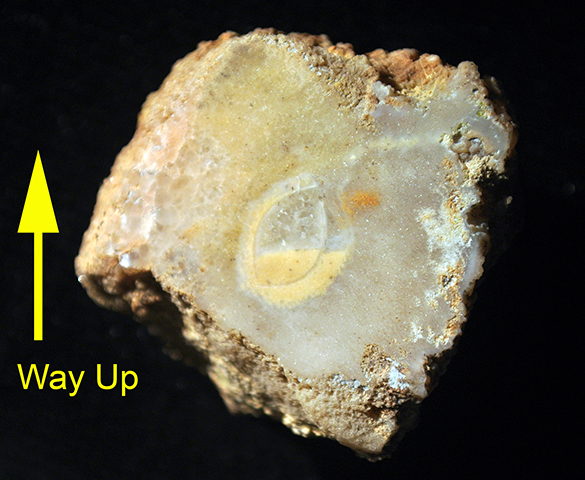 This specimen was collected during my April trip to Israel, a day recorded in this blog. 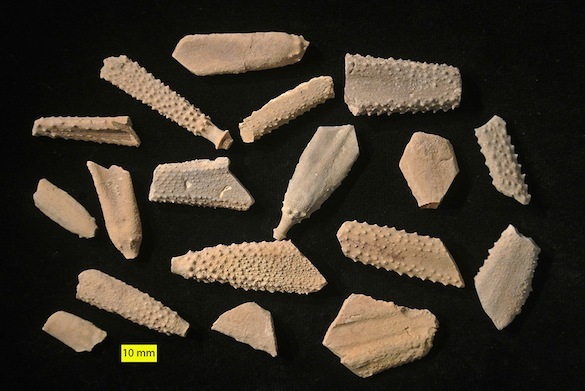 I crowd-sourced the identification of these corals, and they were highlighted as earlier Fossils of the Week. Now I’d like to describe them again with new information, and celebrate the publication of a paper about them. 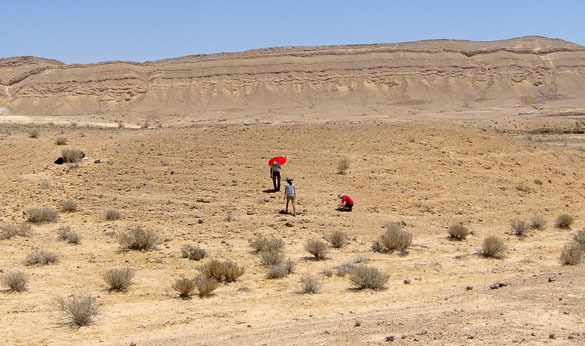 This is the exposure of the En Yorqe’am Formation where Yoav Avni and I collected the coral specimens approximately 20 meters from its base in Nahal Neqarot, southern Israel (30.65788°, E 35.08764°). It is an amazingly fossiliferous unit here with brachiopods, stromatoporoid sponges, zillions of oysters, gastropods, ammonites and the corals. 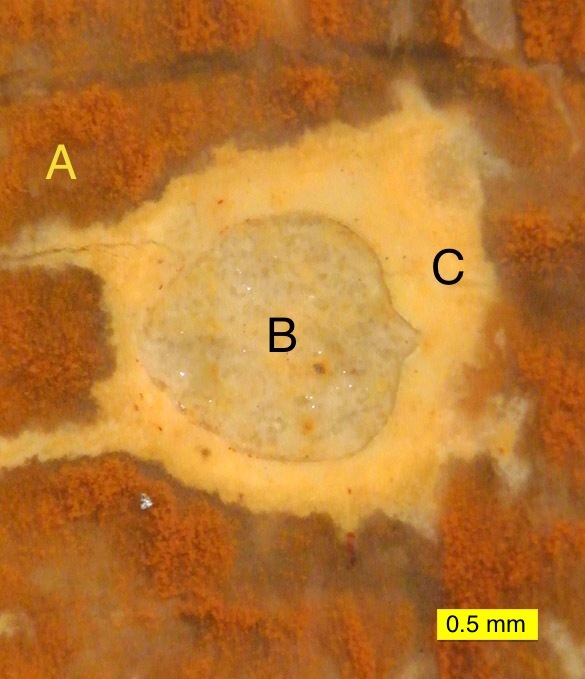 Paired apertures of Gastrochaenolites ampullatus in the coral Aspidiscus cristatus. Polished cross-section through a specimen of Gastrochaenolites ampullatus in an Aspidiscus cristatus coral. In the lower left of the chamber are layered carbonates (A) representing boring linings produced by the bivalve. 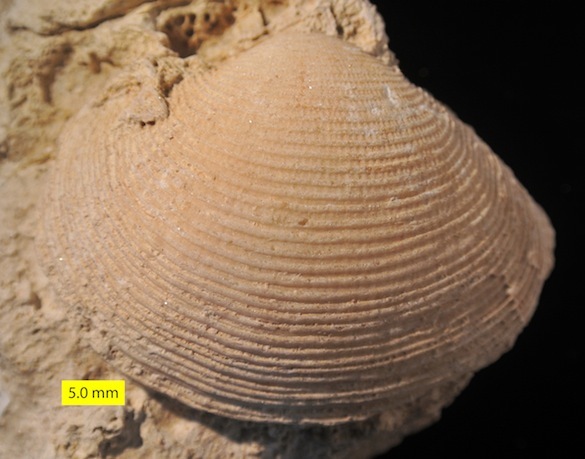 An articulated bivalve shell (B) is preserved in the chamber. The chamber has been roofed over by coral growth (C). Thank you very much to Tim Palmer and Olev Vinn for their critical roles in this paper, and, of course, thanks to Yoav Avni, the best field geologist I know. Avnimelech, M. 1947. A new species of Aspidiscus from the Middle Cretaceous of Sinai and remarks on this genus in general. Eclogae geologicae Helvetiae 40: 294-298. Gill, G.A. and Lafuste, J.G. 1987. Structure, repartition et signification paleogeographique d’Aspidiscus, hexacoralliaire cenomanien de la Tethys. Bulletin de la Societe Geologique de France 3: 921-934. Kleemann, K., 1994. Associations of corals and boring bivalves since the Late Cretaceous. Facies 31, 131-140. Pandey, D.K., Fürsich, F.T., Gameil, M. and Ayoub-Hannaa, W.S. 2011. 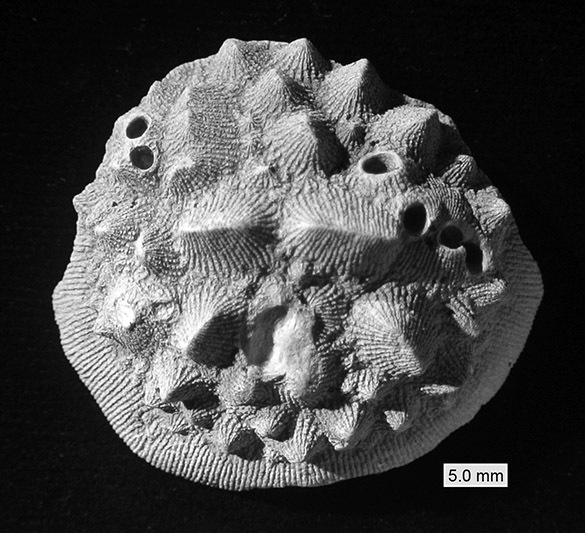 Aspidiscus cristatus (Lamarck) from the Cenomanian sediments of Wadi Quseib, east Sinai, Egypt. Journal of the Paleontological Society of India 56: 29-37. Wilson, M.A., Vinn, O. and Palmer, T.J. 2014. 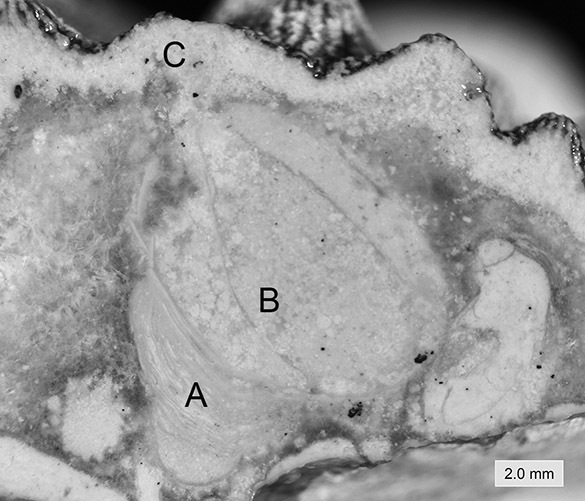 Bivalve borings, bioclaustrations and symbiosis in corals from the Upper Cretaceous (Cenomanian) of southern Israel. Palaeogeography, Palaeoclimatology, Palaeoecology 414: 243-245. 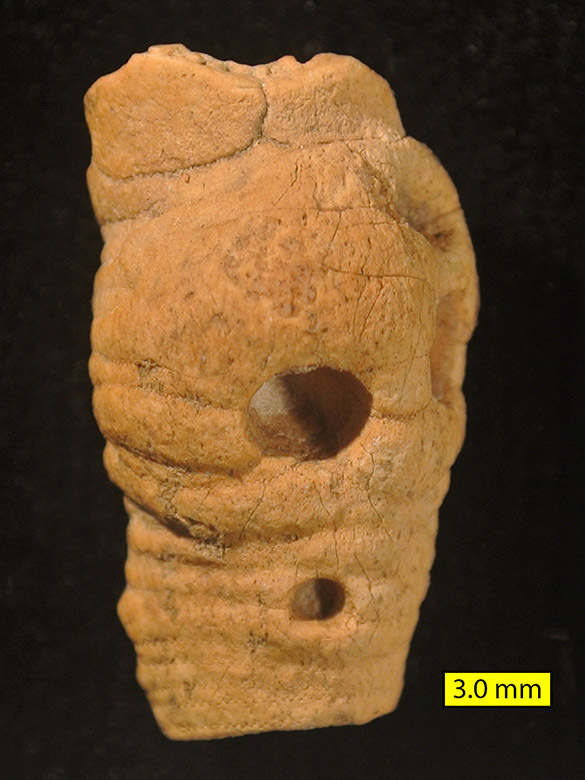 This week’s fossil is again from the Matmor Formation (Middle Jurassic, Callovian) of southern Israel. (What can I say? We have a lot of them!) We are looking above at a crinoid pluricolumnal (a section of the stem made of several columnals) almost completely encrusted by a calcareous sponge (the sheet-like form with tiny pores). A round oyster is attached to the sponge in the lower center. In the left half you see the items of our interest this week: ovoid holes produced by barnacles. This specimen was studied by Lizzie Reinthal (’14) as part of her Senior Independent Study on the taphonomy of the Matmor crinoids. These barnacle holes are interesting because we can see in this closer view that the sponge grew around them. There is thickened sponge wall at the margins of the holes, and the feature in the middle is a thick mound built around one of these holes. The barnacles in the holes and the sponge were living together. If they weren’t either the sponge would have overgrown the empty holes or the barnacle would have cut through the dead sponge skeleton. This is an example of symbiosis. It would be a facultative relationship because the sponge and barnacle did not need each other to survive; each does just fine without the other. It could be considered parasitic if the barnacles acquired nutrients the sponge would have ordinarily received, or vice versa. 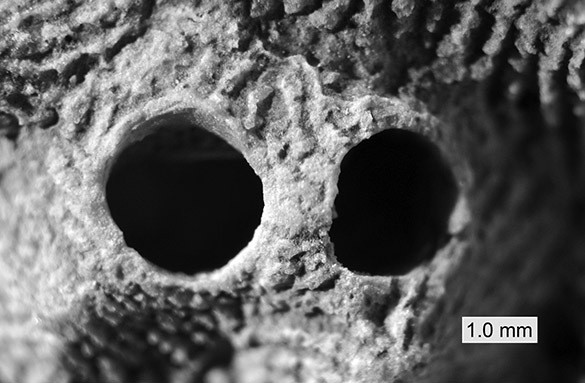 This third view is of the edge of the sponge skeleton as it partially overlaps the barnacle holes. Now we see the nature of the intergrowth. The barnacle holes are actually borings into the crinoid pluricolumnal below. They are the trace fossil called Rogerella, which we have seen before in this blog. The sponge grew along the crinoid substrate covering all sorts of small holes, cracks and crevices, but when it reached these borings living barnacles were still in them filter-feeding away with their filamentous legs. The sponge thus laid its skeleton right up to the hole edges, eventually surrounding them with their spongy matrix. The holes are borings, a kind of trace fossil. The structure created when the sponge surrounds a living boring barnacle like this is more difficult to name. It is not technically a bioimmuration (see Taylor, 1990) because the barnacles were not passively subsumed within the sponge skeleton. It may be a bioclaustration (Palmer and Wilson, 1988) because the sponge adapted its skeleton to isolate and surround the barnacle. 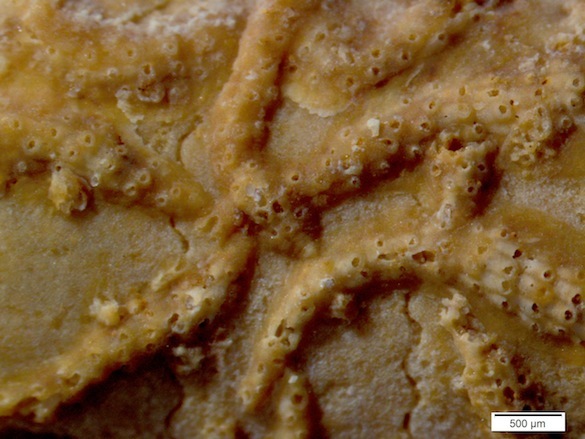 I think we can at least say these are trace fossils in the ethological (behavioral) group called Impedichnia (Tapanila, 2005) because the barnacles acted as impediments, or limiting factors, to the growth of the sponge. I love these examples of symbiosis in the fossil record, and the interesting debates about their interpretations. Cónsole‐Gonella, C. and Marquillas, R.A. 2014. 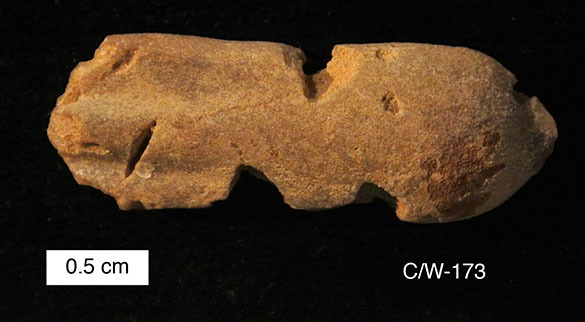 Bioclaustration trace fossils in epeiric shallow marine stromatolites: the Cretaceous‐Palaeogene Yacoraite Formation, northwestern Argentina. Lethaia 47: 107-119. Palmer, T.J. and Wilson, M.A. 1988. Parasitism of Ordovician bryozoans and the origin of pseudoborings. Palaeontology 31: 939–949. Tapanila, L. 2005. Palaeoecology and diversity of endosymbionts in Palaeozoic marine invertebrates: Trace fossil evidence. Lethaia 38: 89–99. Taylor, P.D. 1990. Preservation of soft-bodied and other organisms by bioimmuration: A review. Palaeontology 33: 1–17. Vinn, O. and Mõtus, M.A. 2014. 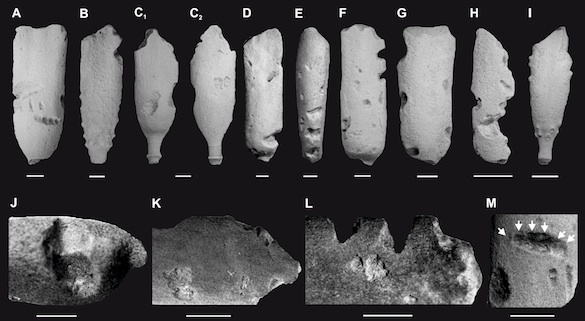 Symbiotic worms in biostromal stromatoporoids from the Ludfordian (Late Silurian) of Saaremaa, Estonia. GFF (in press). Wilson, M.A., Palmer, T.J. and Taylor, P.D. 1994. 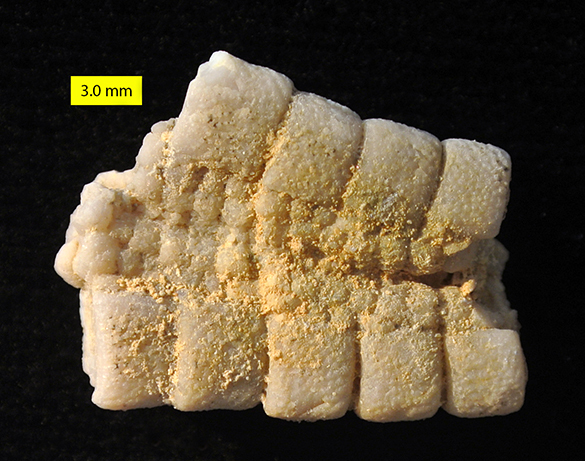 Earliest preservation of soft-bodied fossils by epibiont bioimmuration: Upper Ordovician of Kentucky. Lethaia 27: 269–270. SOSNOWIEC, POLAND — On this beautiful day I began research at the University of Silesia with Michał Zatoń and Tomasz Borszcz in this impressive building. (It is reportedly the tallest Earth Science building in the world, although the Chinese are on the case.) 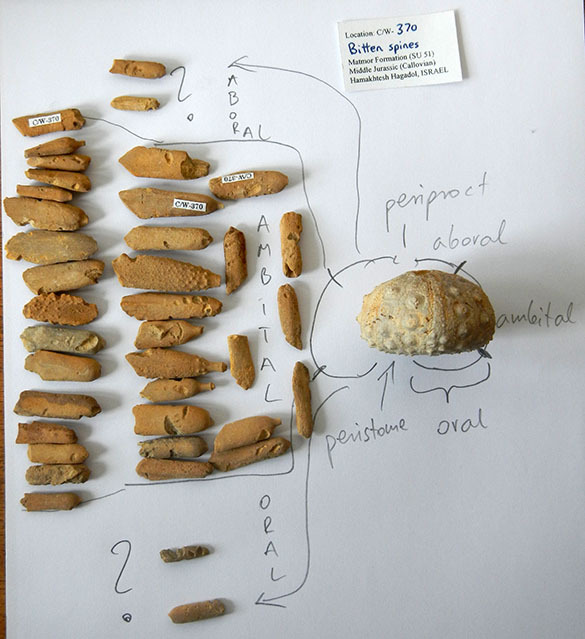 Our first project, and the one I will devote most of my remaining Polish time to, is an analysis of fish-bitten echinoid (sea urchin) spines from the Middle Jurassic Matmor Formation of southern Israel (see below). We have dozens of these crunched rhabdocidarid spines, which are critical evidence of early predation on regular echinoids. We hope our work will help illuminate the evolution of predator adaptations in the echinoids, and the actions of the hungry fish. More on this later. Here we have a simple sorting of the spines in relation to their likely position on the echinoid test (body skeleton). Pretty simple, but it was an easy way for us to discuss spine morphology and function. To give you a glimpse of my new surroundings, here is a view of Michał’s office. 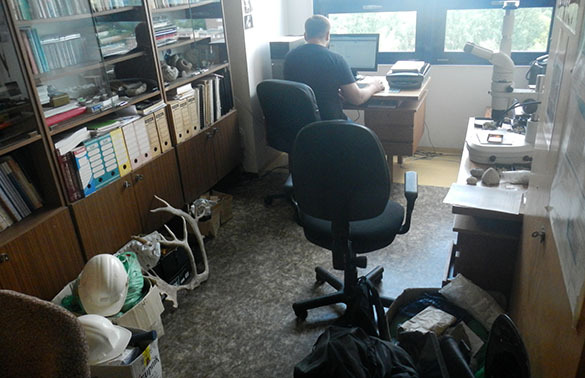 As with every working paleontologist, there are plenty of specimens, books and papers! 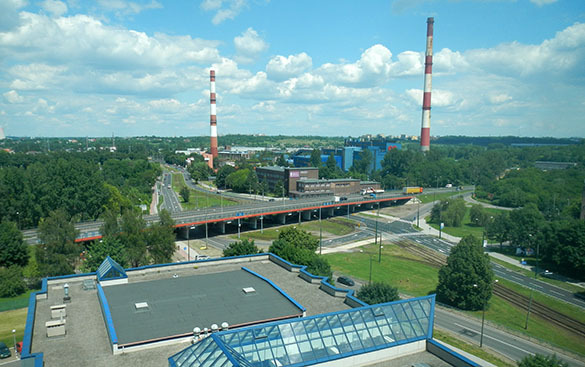 The view from Michał’s office of Sosnowiec. This is looking from Michał’s department building towards a series of dormitories for students at the University of Silesia. 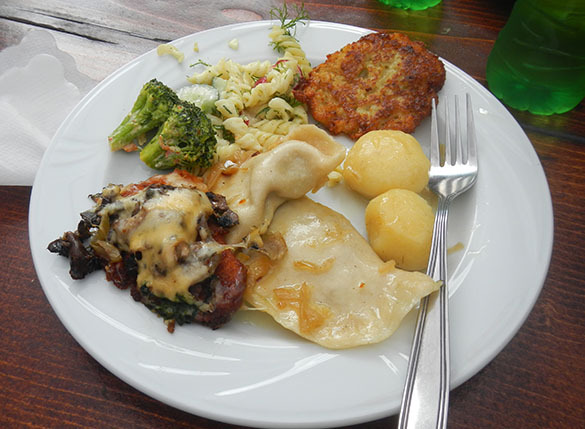 You know at some point I need to show some Polish food. This is today’s lunch. Note the crunchy latke and the pierogis. You pay for this food by its weight on the plate. This scrumptiousness plus a Sprite cost me $4. 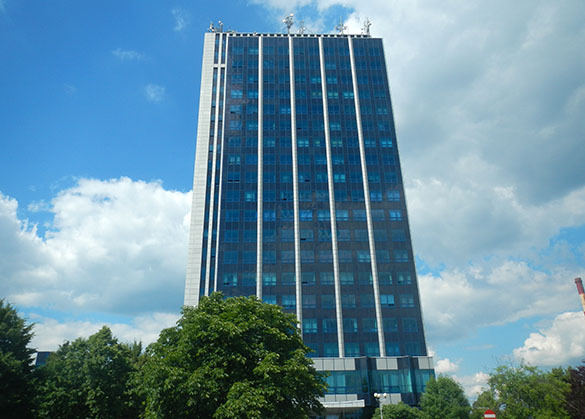 This is my hotel in neighboring Będzin. 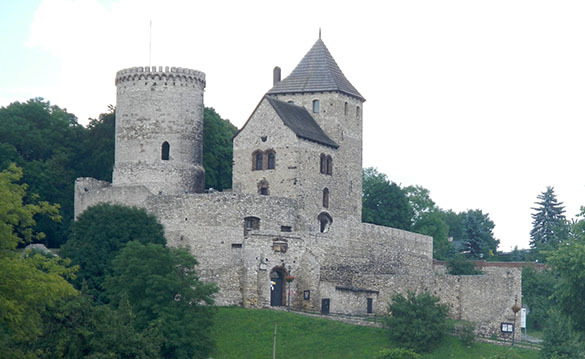 Będzin Castle, which is a short walk from my hotel. You can expect a history post coming up soon! We have a very simple trace and body fossil combination this week that provides a stratigraphic and structural geologic tool. Above is a bit of scleractinian coral from the Matmor Formation (Middle Jurassic, Callovian) of Makhtesh Gadol in southern Israel. The coral skeleton was originally made of aragonite. It has been since recrystallized into a coarse sparry calcite, so we can no longer see the internal skeletal details of the coral. In the middle of this polished cross-section is an elliptical hole. This is a boring made by a bivalve (the trace fossil Gastrochaenolites). 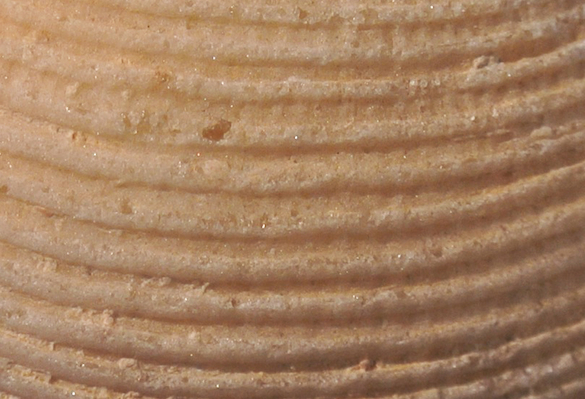 Inside the boring you see a separate elliptical object: a cross-section of a bivalve shell. This could be the bivalve that made the boring or, more likely, a bivalve that later occupied the boring for a living refuge. This, then, is the trace fossil (Gastrochaenolites) and body fossil (the bivalve shell) juxtaposition. That stratigraphic and structural interest is that the boring and the bivalve shell are partially filled with a yellow sediment. This sediment has gravitationally settled to the bottom of these cavities (at slightly different levels). These holes have thus acted as natural builders’ levels showing is which way was down and which was up at the time of deposition. We can tell without any clues from the recrystallized coral the “way up” before any later structural deformation (or in this case rolling around on the outcrop) changed the orientation of the coral. Pretty cool and simple, eh? The name for this feature is a geopetal structure. There are some faulted and folded sedimentary rock exposures in the world where we search diligently for these little clues to original orientation (see, for example, Klompmaker et al., 2013). Not all geopetal structures have fossil origins (i.e., Mozhen et al., 2010), but most do. A little gift from paleontology to its sister disciplines. Klompmaker, A.A., Ortiz, J.D. and Wells, N.A. 2013. How to explain a decapod crustacean diversity hotspot in a mid-Cretaceous coral reef. Palaeogeography, Palaeoclimatology, Palaeoecology 374: 256-273. Mozhen, G., Chuanjiang, W., Guohui, Y., Xueqiang, S., Guohua, Z. and Xin, W. 2010. Features, origin and geological significance of geopetal structures in Carboniferous volcanic rocks in Niudong Block, Santanghu Basin. Marine Origin Petroleum Geology 3: 15. Wieczorek, J. 1979. Geopetal structures as indicators of top and bottom. Annales de la Societé géologique de Pologne 49: 215-221. 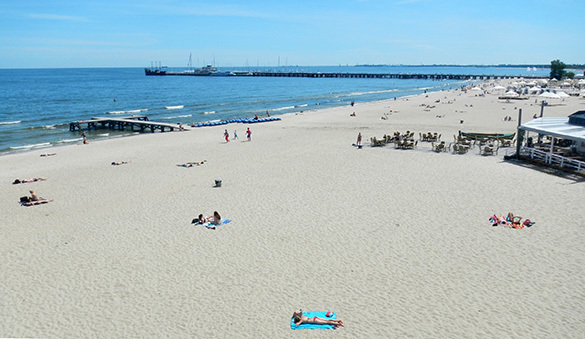 SOPOT, POLAND — Yes, that’s a view from my hotel window. I’ve suddenly found myself in an old resort town on the Baltic coast of Poland near the cities of Gdansk and Gydnia. Another one of those astonishing geographic transformations we can so easily make. I’m here for the Larwood Meeting, an annual gathering of bryozoologists held in various places around the world. Besides learning more about these complex little colonies (both fossil and recent), I’ll be presenting a summary of the work Steph Bosch (’14), Paul Taylor and I did on the new bryozoans from the Middle Jurassic of southern Israel. After the meeting I travel south by train with Tomasz Borszcz to visit Michal Zaton at the University of Silesia for some joint projects. From there it is on to London for a few days with ace paleontologist Paul Taylor at the Natural History Museum. I’m at the end of a research leave this summer so I have more travel than usual. This is not an important fossil — there is not enough preserved to put a name on it beyond Family Goniasteridae Forbes, 1841 (thanks, Dan Blake) — but it was a fun one to find. It also photographs well. This is a ray fragment of an asteroid (from the group commonly known as the sea stars or starfish) I picked up from the top meter of the Zichor Formation (Coniacian, Upper Cretaceous) in southern Israel (Locality C/W-051) on my field trip there in April 2014. We are looking at the aboral (or top) surface; below is the oral view. In this oral perspective you can see a group of tiny, jumbled plates running down the center. This is the ambulacrum, which in life had a row of tube feet extending out for locomotion and grasping prey. 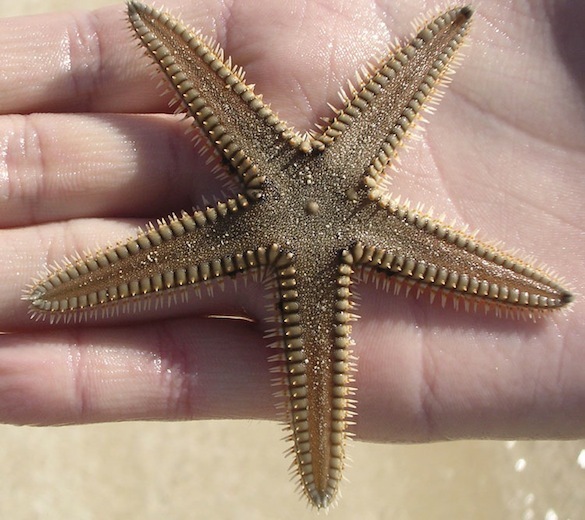 Above is a sea star held by my son Ted on Long Island, The Bahamas, back in 2004. You can see a bit of resemblance between this modern species and the Cretaceous fossil, mainly the large knobby ossicles running down the periphery of the rays. The asteroids have a poor fossil record, at least when compared to other echinoderms like crinoids and echinoids. It appears that all post-Paleozoic asteroids derive from a single ancestral group that squeaked through the Permian extinctions (Gale, 2013). There is a significant debate about the evolution of the asteroids (see Blake and Mah, 2014, for the latest). Unfortunately our little critter is not going to help much in its resolution. Recently it has been discovered that some living asteroids have microlenses in their ossicles to provide a kind of all-surface photoreception ability. Gorzelak et al. (2014) have found evidence that some Cretaceous asteroids had similar photoreceptors. Maybe our fossil goniasterid fragment could yield this kind of secret property with closer examination. Blake, D.B. and Mah, C.L. 2014. Comments on “The phylogeny of post-Palaeozoic Asteroidea (Neoasteroidea, Echinodermata)” by AS Gale and perspectives on the systematics of the Asteroidea. Zootaxa 3779: 177-194. Gale, A.S. 2011. The phylogeny of post-Paleozoic Asteroidea (Neoasteroidea, Echinodermata). Special Papers in Palaeontology 38, 112 pp. Gale, A.S. 2013. Phylogeny of the Asteroidea, p. 3-14. In: Lawrence, J.M. (ed. ), Starfish: Biology and Ecology of the Asteroidea. The Johns Hopkins University Press, Baltimore. Gorzelak, P., Salamon, M.A., Lach, R., Loba, M. and Ferré, B. 2014. Microlens arrays in the complex visual system of Cretaceous echinoderms. Nature Communications 5, Article 3576, doi:10.1038/ncomms4576. Loriol, P. de. 1908. Note sur quelques stellérides du Santonien d’Abou-Roach. Bulletin de l’Institut égyptien 2: 169-184. Mah, C.L. and Blake, D.B. 2012. Global diversity and phylogeny of the Asteroidea (Echinodermata). PLOS ONE 7(4), e35644.